MEMENTO VIVERE, which literally translates as "Remember you must live", is an enthusiastic celebration of life, a hymn to the present moment. 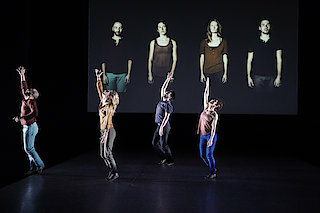 The dancers' bodies express, in haiku-like concision, the inextinguishable joy of being together in an organic relationship, while moving to the hypnotizing rhythms of Steve Reich's Music for Pieces of Wood, or his more contemplative Proverb. The dancers interact with film sequences in an attempt to overcome the conventional codes of physical gestures, inviting us to see the performers in a new and perhaps more intimate light.